He scalped 41 wickets in 58 BBL matches. 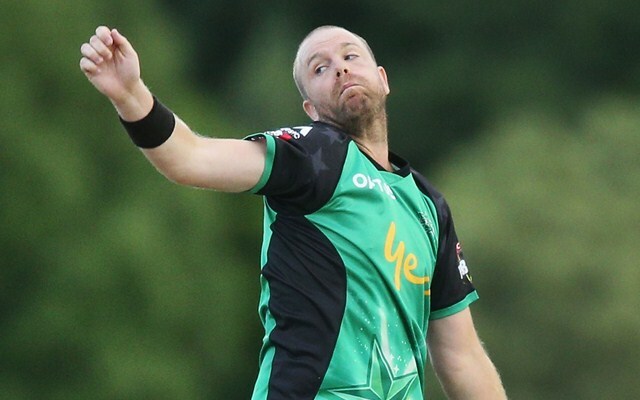 Michael Beer, the Melbourne Stars spinner, announced his retirement from Big Bash League on Friday. The retirement ends Beer’s glittering career in Australia‘s premier T20I competition where he played more than 50 games while representing Perth Scorchers and the Melbourne-based outfit. Beer did not feature prominently for the Scorchers team before being signed up by Stars in a historic first BBL trade deal. During his time with the Scorchers, Beer was constantly being overlooked as the team preferred veteran Brad Hogg and youngster Ashton Agar. With his fortunes showing no signs of improvement, Beer decided to leave the Perth-based outfit for the Stars in 2014. The move paid off as Beer finally started getting the game time and totally justified the club’s decision to sign him. He played an important part for the Stars during his five-season stay. The left-arm spinner often opened the bowling and did a commendable job by not only restricting the opposition but also picking up crucial early breakthroughs. Beer is retiring with one of the best bowling economies in the League at 6.70 and a total of 41 wickets to his name in 58 games. In his goodbye statement, Michael Beer said it had been one of the most enjoyable experiences in his cricket career. “When I first came to the Stars I probably wasn’t enjoying my cricket as much, but the Stars made cricket fun for me again. I’d really like to thank the players and coaches I’ve been fortunate to work with over the years at the Stars, as well as the club staff and the Board for all the support and opportunities they’ve given me and my career both on and off the field. “I’d also like to thank the WACA, Perth Scorchers and Cricket Victoria for my time with them, I’ve been lucky to learn so much from each team I’ve played with. I’m very excited about the next phase of my life, spending time with my family and putting more focus into my coaching. I still really enjoy being around the game and look forward to building on some of the coaching opportunities I’ve had this year,” said Beer. Melbourne Stars head coach Stephen Fleming hailed Beer’s contribution to the club, pointing out the veteran spinner’s ‘all-round service’. “Michael Beer has played a pivotal role at the Stars, contributing consistently with the ball and a key to our spin strategy for many years. We want to thank him, not just for the brilliant job he’s done on-field but his all-round service to the Club,” said Fleming. The Melbourne Stars, meanwhile, need to win one of their remaining two league games to book a place in the tournament finals. They will next play against the Brisbane Heat at the GABBA on Friday before locking horns against the Sydney Sixers at home on Sunday.